eBeam Rocks! | Create an interactive learning experience for every classroom or office! Today we wanted to share with you one of the ways that eBeam can be used which may not be main stream but is innovative. Recently we signed a new client that was looking for a way to improve their trade show demonstrations. The company Origo Education has a suite of educational programs that are centered around math instruction. During their trade shows they have a large TV/Monitor connected to their MAC laptop and they walk teachers through the product. During their previous shows they would rent a touchscreen monitor (at a considerable cost) in their booth. Their challenge was one of cost and logistics. Either renting or shipping this VERY EXPENSIVE monitor created a problem in getting it from one location to another along with the potential damage and repair or replacement. By using eBeam Edge and the LCD Mounting Bracket they are now able to convert any TV or Monitor into a “touch screen” unit by using the wireless pen/stylus. The eBeam Edge can be packed neatly in the available carrying case and taken from show to show. They now only need to have a standard TV/Monitor during the show which allows them to save considerable money over the previous set up. Another idea would be to provide the TV used during the show as a giveaway. With the availability of very low cost large screen units they could potentially save on shipping and handling costs by purchasing a one at each show location. And what a great giveaway to the show participants. So, if you are active in trade shows and utilize a TV or large monitor, consider eBeam Edge as a tool to use for showing your program or tools. eBeam Edge converts TVs, Monitors, Whiteboards, Drywall, Glass Walls, table tops into an interactive environment. Virtually any hard and flat surface that you can project or show your desk top onto can be converted to an interactive space. Leave it to a school district in Silicon Valley to develop a prototype for a blended learning environment. Milpitas Unified School District did just that. They hired a new Superintendent and Chief Technology Officer. They asked the staff at each school what their idea of the school of the future would look like. Once they go the ideas back, they took the novel approach and began building it. Two elementary schools were piloted for the model in 2012-2013 and now all have implemented some form of blended learning. Ø Leaders empowered principals and teachers to integrate technology and implement blended learning any way they wished. Ø Developed a learning lab where students rotate through twice a day for math and English language instruction. Results are favorable so far. The technology has invigorated teachers and students are more engaged in class as evidenced by the dramatic decrease in suspensions and disciplinary actions. Coorado’s Boulder Valley School District is working towards a long-term vision of supplying every student (30,000) with a computing device. While they work up to that they are investing in IT infrastructure, technology pilots and professional development. In Ohio’s Hillard City Schools they have been working on creating online courses for the past 10 years. Most teachers have already turned their classes into blended learning courses through the use of Moodie, Google Apps and their own websites. But they also point out that the district is not exclusively going to online applications. They still use interactive whiteboards, projectors and document cameras. Time limitations on the teachers is a factor especially with a new program, but given time, expanding the teacher’s comfort zone and the programs will allow for students to enter the “real world” better prepared for what’s next. With the continued use of interactive whiteboards we suggest that you look at eBeam products. A big advantage of the eBeam product line is utilizing your existing assets (whiteboard, projector, computer). The only moving part is the wireless pen/stylus. Unlike competitors who require their board to be used, eBeam don’t fail since there are no moving parts or screens. The stylus is subject to failure over time but at $85 each, it is a relatively small replacement cost. Check out the eBeam Product line at http://www.ebeamrocks.com. This goes kind of without saying. With the constant innovations being brought to the market it is imperative for teachers to keep up. The idea that a teacher can continue to use the blackboard, chalk and slides is outdated. Don’t get me wrong, I love teachers and understand the passion that they must have to put up with children, parents and administrators. It is part coach, counselor, therapist, warden and parent all wrapped up in one package. That said, it is also just as important for the teacher to keep up on tools, ideas, techniques for their profession as it is for the doctor or lawyer to keep up with diseases and court rulings. You can’t stay in the past. So, when the budget is tight and money needs to be spent fixing the building or adding on, what do you do? Here are a few ideas we pulled from a recent post by Dawn Casey-Rowe an Author at Edudemic, an online resource for education and technology. They will know how to use it and they will take care of it better. Imagine if you were sitting at home working, and someone came in, took your phone, your laptop, and tablet, and replaced them with a type you don’t use. It’s disorienting. Students and teachers are more comfortable using the devices they love. Tech purchasing comes from top-down. It’s important to be on the front lines when choosing technology. Sometimes a school-wide platform is necessary and helpful, as with electronic gradebooks, home-school communication platforms, or learning management systems. But for the rest, ask, “Will students use this? Will they look forward to using this or will it be a burden? Does it fill some need or make life easier?” Ask. The answers are sometimes surprising. Amazon Prime and Netflix have tons of documentaries and shows that support curricula. Before these were unblocked, if I wanted to show a documentary to my class, I had to buy it. Now I can rely on my Prime, and show ten minutes or so to underscore my point. In addition to this, I love TEDx speeches. They help me teach public speaking and content simultaneously. Students love them, and they’re free. Computer labs are important, but they often come with challenges. They’re expensive, and research is showing that tech in the class saves time and money, increasing productivity. Teachers don’t have to compete for valuable lab time and expensive machines aren’t sitting unused. We’re used to technology integrating into our lives. It must be the same way in schools. Allowing students to use their own devices or having a group for the class to share is less expensive than wasted labs in the long run. I was at a large tech company and needed to print a boarding pass. There was no easily accessible printer. I joked, “This reminds me of schools…printers are broken or out of ink.” Then I realized the truth – printing is so 20th century. It’s rarely necessary anymore, if you stop and think about it. Once tech is fully integrated we won’t need to print much. We’ll google-share, take polls on Socrative, use Learnist instead of books, and crowdsource projects. Killing rainforests will be a thing of the past. These resources on web tools and apps help me think about reducing paper and clutter one piece at a time. But there are also tools and programs that can help with the integration of technology in your classroom. eBeam by Luidia – yes this is self promoting but you were expecting that right? 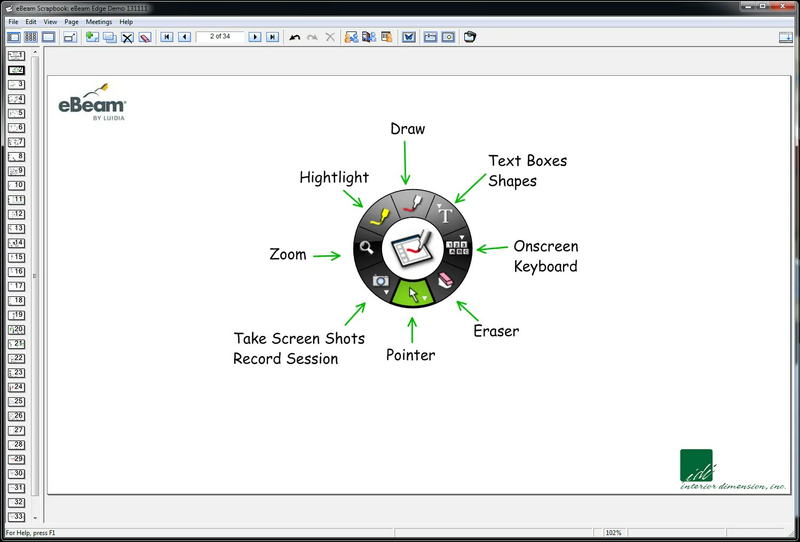 eBeam takes advantage of your existing assets (whiteboard, projector, computer) and allows you to bring interactivity to the class at a reasonable cost. By adding the eBeam receiver to your whiteboard or wall you also don’t have to give up valuable whiteboard space to a static piece of equipment (i.e. Smartboard). 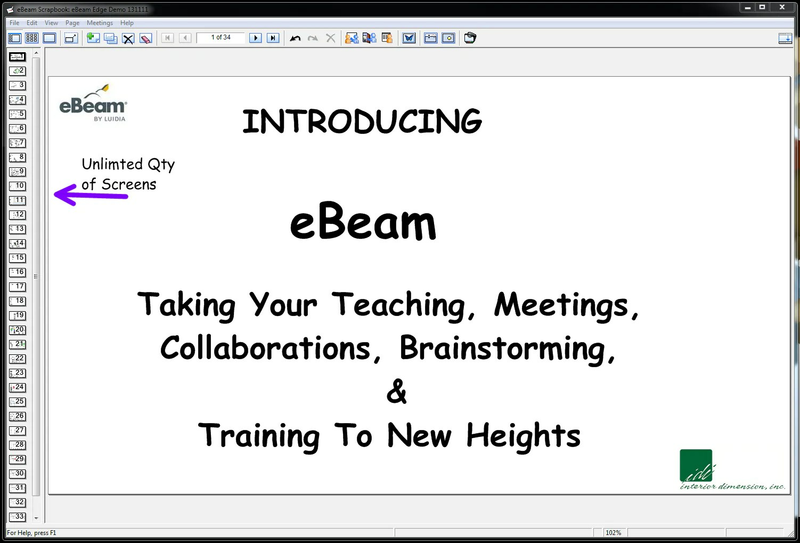 eBeam Connect – This is perfect for pulling students and teachers together to share, everything. Based in the cloud Connect allows you to post and share documents, assign documents to groups where they can work on them together using their own device (See BYOD). Currently this service is free while it’s in Beta phase. It will move to a subscription based model which will then be available on an annual basis. You can see all of the great eBeam products at http://www.ebeamrocks.com. The trouble with whiteboards is they are one dimensional. One surface, very flat and limited to their edges. Once you write your stuff on them it’s locked in, can’t move, can’t be easily transported and shared. Have you ever taken a picture of your whiteboard? How difficult was it to see everything on it? How many close ups did you need to take to get everything? How hard was it to read? Scrapbook and Capture are the programs that come with the eBeam products, eBeam Edge, eBeam Engage and eBeam Livewire. Scrapbook works with a projected surface either with your projector or on a large TV, monitor or Big Screen. 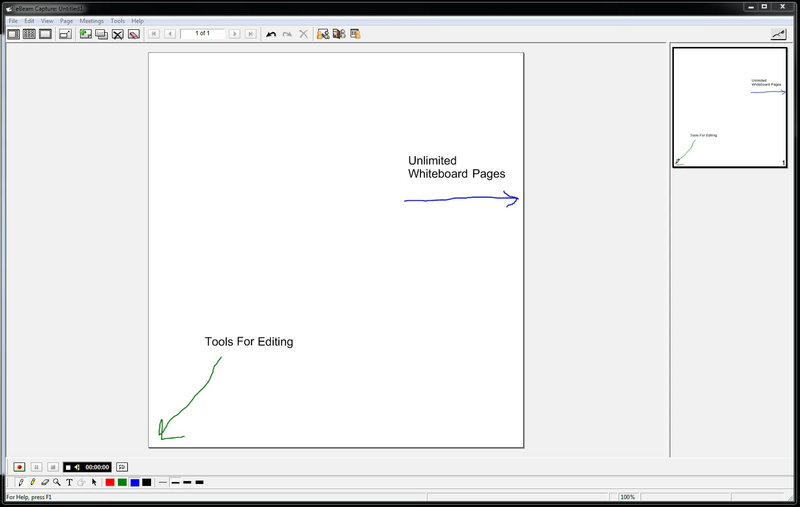 It allows you to develop an unlimited number of whiteboard screens directly on your computer. Draw, design, text, add pictures, insert graphs, web pages – it is truly a full service whiteboarding tool. And when you are finished (of course you are never finished) you can save the file, send it as 9 different formats or share it with your group. Capture works directly on your whiteboard without a projector or monitor. EVERYTHING you write and draw is transferred immediately to your computer where you can save it. After your finished on the whiteboard the software allows you to edit, add to, change and then save your work in up to 9 different formats. Oh, and both of the programs allow you record your sessions in real time and you can conduct online meetings where you share the contents of each program with the participants. So, check out Scrapbook and Capture and see how you can take your meetings to the next level. Save $100 on ALL Edge products by simply answering our 8 question Marketing Survey. No Limit to the number of times you use the discount! Who needs interactive solutions? Let’s first review what an interactive solution is. In our daily lives we have meetings, training sessions, presentations, you may be a teacher, coach, administrator, just about everyone interacts with people during the day. And during these interactions most of the time ideas are shared, information flows and notes are taken. It is during the times of note taking and information flow where Interactive Solutions are needed. Too often these sessions are one dimensional. A flip chart being used, a whiteboard or whiteboard painted wall, a PowerPoint presentation be displayed or just your desktop is being displayed. This allows for a presenter and a viewer, but it isn’t interactive. To be interactive more than one person needs to be able to interact with the information. This can be done through a file sharing application, web meeting or similar application. Too often these cost money to set up and maintain, have to be scheduled in advance and as we’ve all see are easy to crash or fail and usually at the worst time possible. So why do you need an interactive solution? The interactive solutions provide an easy way to capture and share information. You spend less time copying and transcribing notes, ideas and sketches and more time implementing the ideas and plans. Productivity goes up, mistakes and problems go down. eBeam offers all of this interactivity inside two different applications. eBeam Edge is a simple, elegant and cost effective way to set up an interactive space. Whether you are using a projector, tv or monitor, whiteboard, whiteboard painted wall, glass wall or even a table to with an ultra short-throw projector. eBeam Edge allows you to convert virtually any hard surface to an interactive surface. 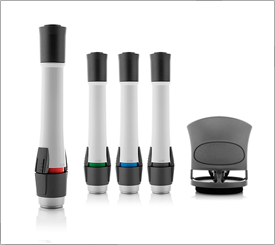 eBeam Edge attaches quickly to any metal backed whiteboard or presentation board. It also comes with brackets that are held in place with 3M Command Strips to you eliminate damage to any walls when removing the tape. With a special bracket the Edge device can be attached to almost any large screen TV or monitor. Load the programs (usually in 20 minutes or less) and you have now created a touch screen surface anywhere you can project or show your desktop. The image can be as large as 60”h x 108”w large enough to make any small detail stand out. Now that you are set up, if you showing your desktop you have created a touch screen surface. Interact and run any program that you have loaded on your computer. From Word to Excel to AutoCAD to PowerPoint anything can be operated from the image. When you run the Scrapbook program you have the ultimate electronic whiteboard application. With unlimited screens and the ability to import, export, take screen shots, record video and audio you have a program that will make all of your sessions more productive. Once the event is finished you can edit, save and distribute the information in up to 9 different formats. Imagine conducting a client presentation or review and then forwarding them a video of the entire event including sound so they have it before they get back to their office. How cool would that be. Or conduct on on-line meeting walking through all of the issues and recording it at the same time and sending a link to file within minutes of completing the presentation. Do you hear the same cash register sounds I do? So what if you aren’t using your desktop, but instead have a plain old whiteboard or the newest tool a whiteboard painted wall? No problem. With the Capture program you quickly and easily turn this space into an electronic copyboard. EVERYTHING that you write on the board or wall is instantly sent to your computer. Once on the computer you have the ability to edit, add to, save and distribute the information in a similar way to the Scrapbook program. You can even conduct on-line meetings where you share the content of your whiteboard and record all of your events showing the details of the whiteboard and voice as it is picked up by the computer. So you see interactive solutions are a great tool and eBeam is one of the best. Want to learn more? Go to www.eBeamRocks.com where you can see all of the eBeam products and other devices to support them. Check out the videos where you can see how the product works and all of the training tools to help you get up and running quickly. The challenge of many interactive solutions is that IT is required to download, install and set up the software. Once the software is installed the screens or board must be calibrated. Once all of this is done then you can begin working on them – well after a potentially long training period. And this is the downside of these expensive solutions. The more expensive generally the more costly in time and money is the training. Your investment is small – as little as $649.00 for the USB version to $999.00 for the eBeam Edge Wireless with Capture Pack version. Add a Battery Pack and you have a complete system for just under $1100. This is a small investment that can be picked up and moved from room to room, taken on the road and set up in minutes. I recently saw a post about some of the great apps that have been developed using smart phones and tablets to take pictures of people whiteboards. Some are very cool. But I have to ask, what can you do with it? It is a picture and pictures are 1 dimensional. Yes you can share it easily, you can pass it around and post it. But it is still one-dimensional. Might I suggest that you take a look at eBeam Capture. With Capture attached to your eBeam Edge or Engage you no longer need to take pictures. Capture allow you to collect everything as you write it onto your computer into the Capture Program. Capture contains an unlimited number of white screens that you draw your stuff into. Once on the computer the fun really begins. Add to what you have developed, duplicate, copy, paste, alter, change, erase, group, ungroup, change layering, add text, add shapes. And once you are done . . . . Pass it around as a Capture file (native file format), PDF, JPEG, GIF, Powerpoint. Truly this is a more productive way to using your whiteboarding session. So check out Capture at http://www.ebeamrocks.com today and see what you can do.